We recommend checking out our discussion threads on the Lenovo ThinkCentre M83 Mini Tower Desktop Computer 10AL0012US, which address similar problems with connecting and setting up Desktop Computers Lenovo. The user manual for the Lenovo ThinkCentre M83 Mini Tower Desktop Computer 10AL0012US provides necessary instructions for the proper use of the product Computers & Solutions - Desktops & Workstations - Desktop Computers. The ThinkCentre M83 Mini Tower Desktop Computer from Lenovo is a secure and manageable desktop with a mini tower form factor. The system is powered by a 3.6 GHz Intel Core i7-4790 Quad-Core processor that will allows you to run multiple applications simultaneously. The processor also features a burst speed of up to 4.0 GHz and the 4GB of 1600 MHz PC3-12800 DDR3 RAM, which can be upgraded to 32GB (4 x 8GB 240-pin UDIMM slots), also assists with multitasking and allows the computer to quickly access frequently-used files and programs. For long-term storage of your files, a 1TB 7200 rpm 3.5" SATA hard drive allows quick access to your data. The integrated Intel HD 4600 graphics is designed to deliver a sharp, clear picture while allowing for a wide range of monitors to be used via its dual DisplayPort (max resolution of 3840 x 2160 @ 60 Hz) and single VGA port (max resolution of 1920 x 1200 @ 60 Hz) outputs. The GPU also supports use of up to three simultaneous displays. Whether you are watching a movie, playing a game, or listening to music, the Realtek ALC662 audio codec outputs HD sound and achieves higher fidelity than standard controllers. External peripherals, such as additional storage, optical drives, printers, memory card readers, and more may be hooked up using the 4 x USB 3.0 ports and 4 x USB 2.0 ports. There is also a serial port and internal expansion may be accomplished using the 3 x PCIe slots. There are also a total of 3 x 3.5" internal bays and 2 x 5.25" external bays. Network connectivity may be achieved using the integrated Gigabit Ethernet port. The ThinkCentre M83 Mini Tower includes a USB keyboard, a USB mouse, and a power cord. Its 280W power supply is auto-sensing and while the installed operating system is Windows 7 Professional, a Windows 8.1 (64-bit) license is also included. If you own a Lenovo desktop computers and have a user manual in electronic form, you can upload it to this website using the link on the right side of the screen. Box Dimensions (LxWxH) 20.945 x 19.843 x 11.89"
The user manual for the Lenovo ThinkCentre M83 Mini Tower Desktop Computer 10AL0012US can be downloaded in .pdf format if it did not come with your new desktop computers, although the seller is required to supply one. It is also quite common that customers throw out the user manual with the box, or put the CD away somewhere and then can’t find it. 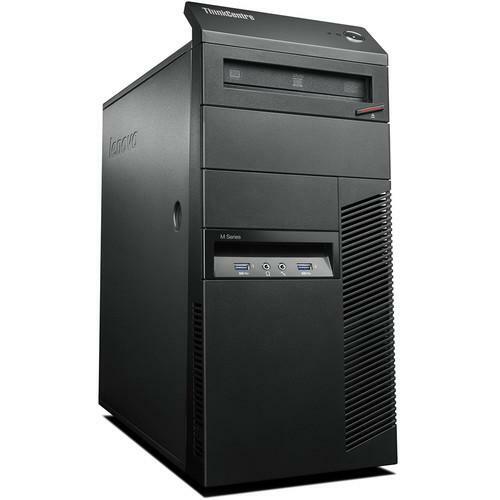 That’s why we and other Lenovo users keep a unique electronic library for Lenovo desktop computerss, where you can use our link to download the user manual for the Lenovo ThinkCentre M83 Mini Tower Desktop Computer 10AL0012US. The user manual lists all of the functions of the Lenovo ThinkCentre M83 Mini Tower Desktop Computer 10AL0012US, all the basic and advanced features and tells you how to use the desktop computers. The manual also provides troubleshooting for common problems. Even greater detail is provided by the service manual, which is not typically shipped with the product, but which can often be downloaded from Lenovo service. If you want to help expand our database, you can upload a link to this website to download a user manual or service manual, ideally in .pdf format. These pages are created by you – users of the Lenovo ThinkCentre M83 Mini Tower Desktop Computer 10AL0012US. User manuals are also available on the Lenovo website under Computers & Solutions - Desktops & Workstations - Desktop Computers.